WELCOME TO DAY 6 OF MY 12 DAYS OF CHRISTMAS DECORATING, CRAFT AND GIFT IDEA CHALLENGE. Today’s FABULOUS idea comes from The Surly Mermaid. She is a good friend of mine and does monthly “snippet” blog posts here at A Wandaful Thing. She has many other talents besides her quirky , off the cuff writing style and she is sharing one with us today. Check out her nails!!! Love them! 2 – Large pot with dirt- I used an outside garden pot that I grew tomatoes in this past summer. 3 – Decorative bits and bobs on sticks- I bought some of these at Home Depot as well for $4.99 each, they included pine cones and wooden gold orbs. 4 – Long twigs from a colorful bush or large sparkly plastic red ones from the Dollar or craft store. 5 – I made a bow with ribbon I had (doesn’t it just Roar Christmas…lol) and wired it to a trimmed pine bough with florist wire – a twist tie would work just as well or y0u could use a hot glue gun to secure it in place. Assemble by inserting everything into the dirt in the pot and voila!! 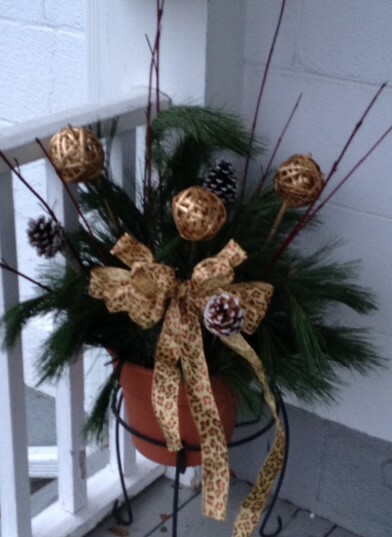 It looks fantastic on her stoop – it’s indeed A Wandaful Thing!! Thanks Surly for sharing this with us! 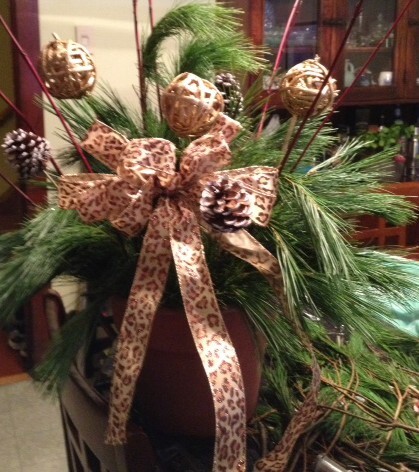 This entry was posted in Decorate, DIY and tagged boughs, challenge, Challenges, Christmas, Crafts, crafts, Decorate, DIY, easy, guest blogger, Guest Posts, pine, planter, reuse, ribbon, shears, stoop, urn. Bookmark the permalink. Pingback: Worth taking a look! Blog Loving! | You Can Always Start Now! I love this! Especially the leopard print ribbon. With this planter, wreathes and other outdoor decorations the place must look great. Loving my 12 days! !